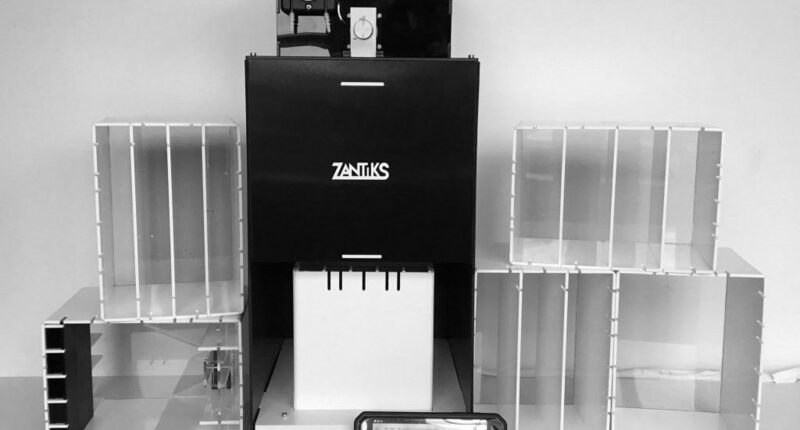 The Zantiks AD helps standardise behavioural experiments in animal models, such as adult zebrafish and mice. To use the Zantiks unit you need a small space on your lab bench, a nearby power supply, and your own browser-enabled device (e.g. smartphone/tablet/ laptop/PC/ Mac). *One Zantiks router is supplied with the first unit, this is usually a Cisco router with 4 LAN ports and 1 WAN port. Subsequent units can be networked to this router, using a network switch if necessary. Peristaltic pump unit for liquid delivery (which attaches to the motor). We recommend you use the following tubing with it: 2mm internal diameter, 4mm external diameter silicone tubing. Place the AD unit on a stable surface close to a power socket and away from disturbance. Connect the ethernet cable at the back of the Zantiks unit (see image (i) below) and plug this into any of the 4 slots available in the LAN section of the router. Insert the 12V power supply cable into the back socket of the AD located below the ethernet cable (see image (i) below) and plug it into the mains socket. Turn on the router and turn on the mains socket for the Zantiks unit. When the Zantiks unit powers on, a text screen will load and scroll across the screen in the unit. The unit’s IP address will display on the screen each time the unit is turned on (see image (ii) below). The IP address is used to identify the unit on the Zantiks Control Console. go to the address bar of the web browser and type in the IP address for your Zantiks unit (see step 5.). 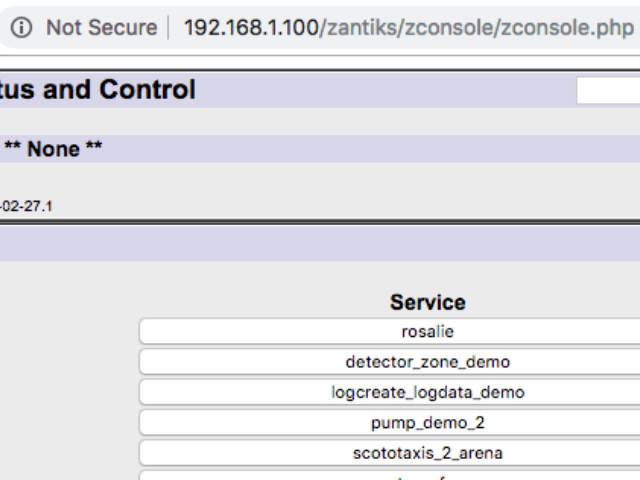 Your web browser should now display the Zantiks Control Console page (see image (iii) below). i) Zantiks AD as viewed from the back of the unit: the (orange) ethernet cable plugs in top right; directly below is the 12V cable plug; CN8 4-way socket is for the overhead lights; CN5 socket is for the shocking plates; CN1 and CN2 are for the 2-wire cable from the screen (the built-in bottom screen and the side screen if used). The AD unit comes with a built-in bottom screen and the option to buy a side screen for lateral presentation. The side screen can be used instead of the bottom screen. Both screens cannot be in use at the same time. The side screen can sit at either the back or at the front of the chamber. A tank consisting of 3 black walls, a clear tank floor and 1 clear side wall (to place against the side screen) is supplied. An extension HDMI cable, for use with front placement of the side screen, and a 2-choice insert come as standard with a side screen. Currently in development is a 2-choice food hopper insert which can be used when visual stimuli and solid food stimuli are presented together at the front of the chamber. Shutdown the unit and unplug the power supply when switching from the bottom screen to the side screen. The side screen unit has 2 connections: an HDMI cable and a 2-way green, connector plug with 2-wire (black and white) cable. These are identical cables to the built-in screen. Note the the 2 holes at the bottom of the side screen unit. Unplug the built-in screen's cables with care - the HDMI cable (which comes out of the top box) and a 2-way, green connector plug with 2-wire (black and white) cable which plugs into CN1 or CN2. Please note the additional 2-way green, connector plug with the black and red 2-wire cable is for the infra-red lights located at the base of the unit. Slide the screen back until the cables are fully out of the unit and the side screen is flush against the back wall . When the side screen is at the back of the unit the two screws that protrude up from the bottom screen should slot into the holes located under the side screen unit. 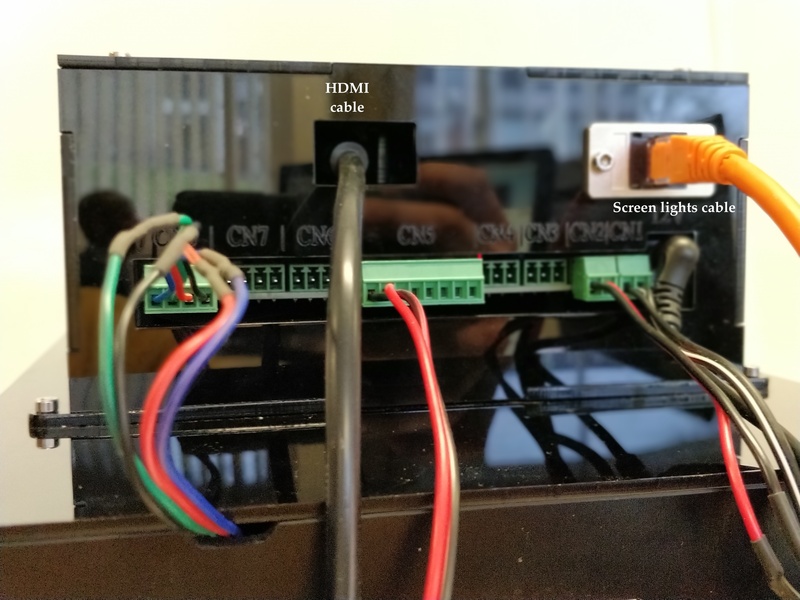 Once the side screen is in place, plug in the side screen cables, taking care to insert the HDMI cable in the slot found in the back of the top box, and the 2-way green, connector plug into CN1 (or CN2). Re-connect the unit to the power supply. An external light can be used with the side screen to illuminate the food magazine when reward is delivered. The external light's 4-way connector plug slots into the back of the top box at CN7. The external light hooks onto the top of the end of the tank, once the tank is in the chamber. It is recommended that you first try attaching the external light to the tank whilst the tank is outside of the chamber. Then take it off to slot the tank into the chamber. The tank will not slide into the chamber with the external light attached. The side screen has different dimensions to the bottom screen. The images on the side screen will appear elongated (the pixels are not square, but instead 1 x 0.7). Consequently you need to resize any images / bitmaps that you use so that the horizontal dimension is 0.7 of the original bitmap. For details on writing a script and creating bitmap images for the side screen see the Side screen demo script webpage.